The DTAPU60 series of AC/DC desktop power supplies provides 60 Watts of continuous output power in a 4.65 x 1.85 x 1.19 inch package. This series consists of single output models ranging from 12VDC to 48VDC with a 90~264VAC input voltage range and an IEC-320-C14 AC inlet connector. Some features include high efficiency up to 87%, -40°C to +70°C operating temperature range, and over current protection. All units are UL 94V-1, RoHS2, and CEC & Energy Star Level VI compliant. This series also meets FCC Part-15 class B and CISPR-22 class B emission limits. All models meet new CE requirements and have UL/cUL (UL 60950-1: 2nd edition) and TUV/GS (EN 60950-1: 2nd edition) safety approvals. All units have been 100% burn-in tested. 2. DTAPU60A-105 need to use AWG#16/4FT output cable in order to meet all listed specifications. 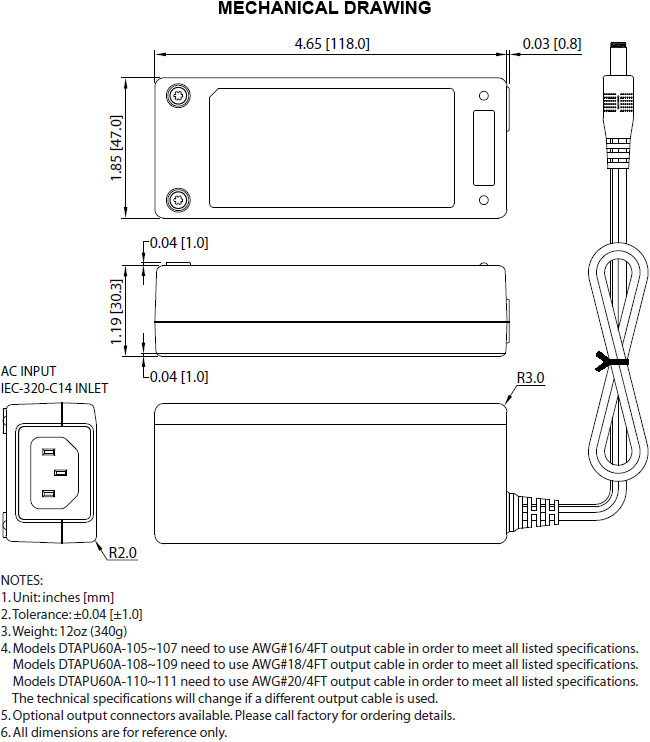 Models DTAPU60A-106~111 need to use AWG#18/4FT output cable in order to meet all listed specifications. The specifications will change if a different output cable is used. 4. At factory, each output is checked to be within voltage accuracy in 60% rated load condition. 5. 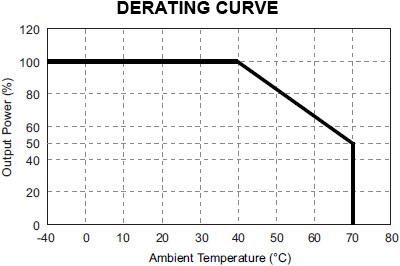 Line regulation is defined by changing ±10% of input voltage from nominal line at rated load. 7. Ripple & Noise is measured by using 20MHz bandwidth limited oscilloscope and terminated each output with a 0.47uF capacitor at rated load and nominal line. 8. Hold up time is measured from the end of the last charging pulse to the time which the main output drops down to low limit of main output at rated load and nominal line.